Product: Miro 3-R Spacer, 7.5x7.5 Polycarbonate. Fits under the 3-R Pipe Support to add 2 inches of height, at a lower cost. 24/Case. Price/Case. 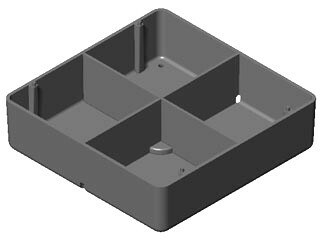 Description: The Model 3-R Spacer is 7-1/2" square and the base is gently rounded to prevent gouging the roof. The outer edges are raised 2" and increased elevations may be achieved by stacking the 3-R on each other, each with a height of 2". Two drainage ports are provided to prevent ponding within the device. The dimensional area resting on the roof is 7-1/4 inches square and 52.56 square inches of contact for spreading stress across roof area. Size: The deck base is 7-1/2" square, the top of the spacer is 2" high. Max Pipe Clearance: Pipes supported by the Model 3-R have a clearance of 2-1/8". Each 3-R spacer increases the clearance of the pipe by anadditional 2". Max Load Weight: Maximum load weight may not exceed 100 lbs. Spacing: Manufacturer's recommended spacing is not to exceed 10 feet centers depending upon the load. Make certain each pipes tand is properly elevated to even load weight at all pipes tands.